Another important difference between wildlife and drones is that wildlife (including birds) have a natural collision-avoidance system and a built-in will to survive. Pilots frequently see this first-hand when spotting birds in-flight and observing their efforts to avoid collision with the aircraft. Conversely, UAS as discussed in the paper are not currently equipped with built-in collision-avoidance capability. The United States has one of the safest aviation systems in the world thanks to thorough testing and evaluation of nearly all aspects of the system. It is through this level of detail that we continue to maintain one of the safest periods in aviation history. 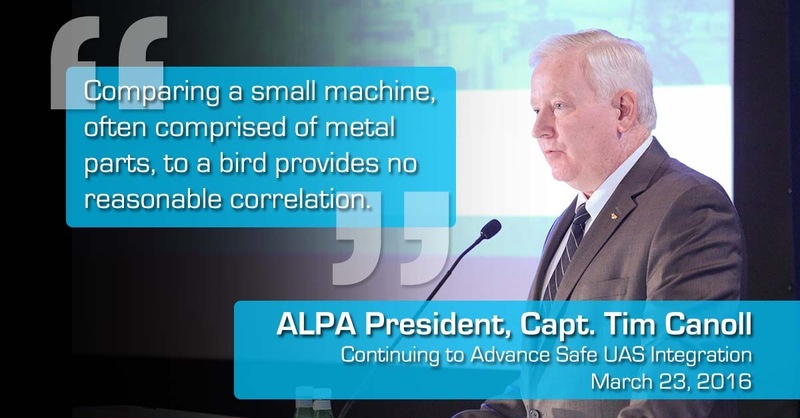 ALPA is proud to be the largest, nongovernment aviation safety organization in the world, and we will continue our long history of advocating for aviation safety through all means possible.